Arabian people have never been terrified by any sort of threat until MERS-CoV came into the picture. 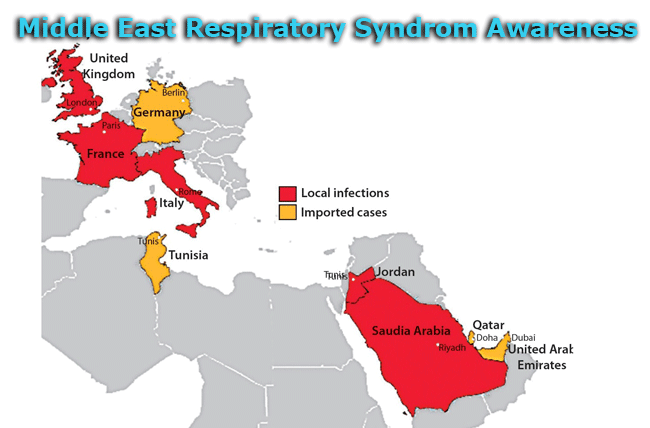 Middle East Respiratory Syndrome commonly known as MERS-CoV is a type of viral respiratory illness originated mainly in the Arabian Peninsula. It had been referred to as novel coronavirus. Due to its clinical similarities with SARS-CoV, it gained its name SAUDI-SARS. The first known case was recorded in 2012. It has made its way to several countries specially Philippines, Malaysia, Indonesia and the United States and is still spreading. One may have the virus but can go asymptomatic until his immune system fails to protect him any longer. Having the virus without any symptoms poses greater risks of transmission hence, more difficult to control. Direct contact can spread the virus person after person.Significantly, travelers have contributed indispersing the virus. That explains why it has diffused to distant countries. People who have been infected by corona virus developed severe acute respiratory illness. Early signs and symptoms are fever, cough and shortness of breath. It has been recorded that about 30% of these people died. Several factors contribute to high morbiditylike secondary diagnoses, immune compromised individuals, and extreme age. Possible complications are debilitated quality of life, expensive health care cost and the worst is losing loved ones. CDC has imposed several measures on how to deal this soon-to-be neighborhood killer. First, the proper and frequent hand washing. Avoid touching your eyes, nose and mouth with unwashed hands. Second, avoid close contact such as kissing and shaking hands with sick people. Last but not the least, cover your nose with tissue during coughing and sneezing. Now that we know how deadly this virus could be, it is vital that we expand our awareness about the ABC’s of coronavirus. Knowledge offers you not only power but weapon.